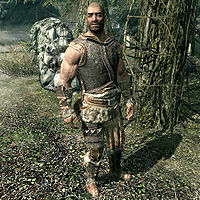 Kust is a Nord monk from Falkreath, where he tends to the biggest graveyard in Skyrim. He is the assistant to town priest Runil who tends the shrine to Arkay, and they both live in the Hall of the Dead. Kust wakes up early at 5am and immediately heads up to Dead Man's Drink for four hours of mead and food. At 9am he walks down to the graveyard and watches it for ten hours before returning to the tavern at 7pm for a one-hour dinner. He then walks directly back to the Hall of the Dead and goes to bed. He wears a set of iron armor, including matching pairs of gauntlets and boots. He is equipped with an iron dagger, and carries a key to the Hall of the Dead as well as a selection of common items and gold. Runil: "There are a lot of good men buried here, Kust." Kust: "Men aren't good or bad. They're just men." Kust: "The graveyard has been lonely. Few pay homage to the dead." Runil: "Few want to be reminded of mortality in a time of war, Kust." In Lod's Lot, local blacksmith Lod would have stolen a book from a grave. Upon telling this to Kust, he would have responded: "I knew something was up. I'll make sure he doesn't disrespect this place anymore. Honesty is a rare thing to find these days. Thank you." In Runil's Dark Past, his own boss would turn out to be a former member of the Thalmor, and Kust would be understandably upset: "I knew he was troubled but one of the Thalmor? I wish I could say I did not believe it. Thank you for telling me." This page was last modified on 25 January 2015, at 04:41.